There has been a library in Corpus since the mid-fourteenth century. From 1929 the College’s undergraduate library was housed immediately beneath the Parker Library on the southern side of Wilkins’ New Court. It was known as the Butler Library. By the end of the century, both the Parker and Butler Libraries had reached a desperate crisis of space. The imminent availability of a former bank building, on the outer corner of the College site, suggested a solution, which was to create a new student library. When the bank’s lease expired in April 2005, the College reclaimed it and began construction to transform the northwest corner of the College site into the new Taylor Library, named after its principal benefactor Dr John C Taylor, inventor and Old Member of the College. In late January 2008 the scaffolding came down and the library was opened to the students. Since the main entrance into the Library is from within the College site, leading into it from what is now called Library Court, the former nineteenth-century street entrance became redundant and was closed off. 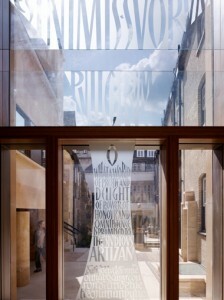 The old stone doorway of the former bank now provides the frame for the Corpus Clock, which was designed and given to the College by Dr Taylor, and was unveiled by Professor Stephen Hawking on 19 September 2008.